Interested in learning how to paddleboard or want to rent some boards? We have everything you need! We are St. John’s only paddleboard only business this means we live and breathe paddleboarding. We are not a bar on the beach that has some boards laying around, we are not a Kayak or Dinghy rental company that rents out some boards on the side. “There is no one board that fits all. We have over 50 paddleboards in various different shapes and sizes. We have small, light, soft boards for 6 year old kids, super stable beginner boards on which we got 75+ year old ladies up and running. We have SUP Yoga Boards, Tandem boards that can float 2 adults standing up or XXL sized paddlers (our XXL board floats up to 450lbs!) as well as high end carbon race boards like the 14′ board on which I circumnavigated St. John and paddled from Beef Island, Tortola to Jost van Dyke. You will have so much more fun and be much safer when you have a board that is right for you. Want to catch some waves? No problem, we have SUP Surfboards and normal surfboards as well. Have a party with multiple people? No problem, send me their details and I will recommend the boards that best work for your group. We have boards for beginners, intermediate and expert paddlers. Even for the “standard” beginner boards, a petite lady should not paddle the same board as her 6’3″ 250lbs husband. SUP is one of the few sports where the ladies can truly compete with the guys, but only if they have the right board! Where is sup-stjohn located? How to I rent a paddleboard on St. John? In order to offer such a wide selection of high quality boards at a very competitive price, we don’t have a shop, we keep the boards at the house and deliver them to the villas, usually the evening before the rental starts so you have everything ready on your car and can either sleep in or go for a sunrise paddle. We have tried many transport systems and found the best soft rack system (we have showed it to most St. John car rentals and they approve board transport with our soft racks) to put on your car and we will load the boards on the car for you. We ask you to reserve the boards via email supstjohn(at)gmail.com or text 340-514-5527 at least a day before (no deposit required) so that we can get it into the delivery schedule. Or you can fill out this form then we will have all the info to find you the right boards. Our trusted delivery jeep will bring you the boards even to the most remote villas. Lucy is delivering most paddleboards in person and is happy to give you tips on how to paddle and where to go. Have you rented with us before or know how to paddle and how to load the boards on car? No problem we can just have the boards sitting at your villa upon arrival. 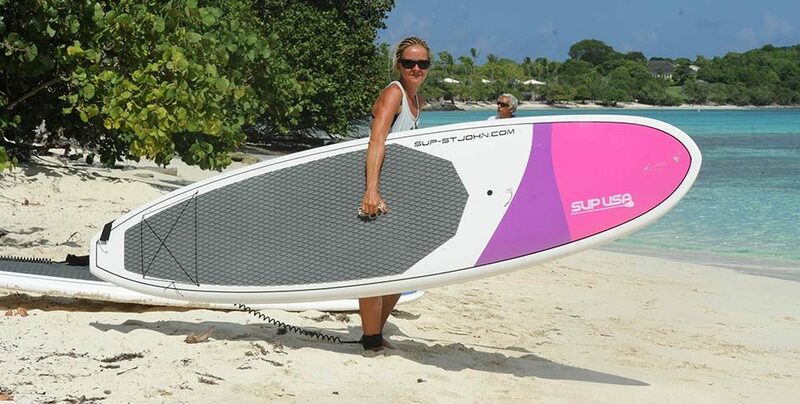 SUP Yoga board super big and stable for Yoga on the water or to take the whole family out. What is included in the paddleboard rental? For day rentals, delivery is included anywhere on the Cruz Bay side of island. For weekly rental, delivery to Coral Bay is included as well. If you are staying in Coral Bay and want boards for a day only, we can meet you at Chateaux Bordeaux on Centerline.